What are some Lake Shore firsts for the design of this instrument? That is, what features and capabilities are not found on previous instruments, including the Model 121 programmable DC current source? Adam: Compared to the 121, the 155 is a completely different instrument. The 121 is a current source only, and its current outputs are finite and predetermined. But the 155 is a true source, with high resolution, and low noise while being able to excite a circuit with up to a 100 kHz AC signal. The other noticeable major change is, again, the touchscreen; where in the past, we’ve used LCD or vacuum fluorescent display technologies combined with tactile keypads. It’s a bit of a paradigm shift to remove the tactile keys, but we’re confident that with the efforts put into the UI/UX design customers will find this instrument even easier to use than our current platform. Finally, this instrument has built in Wi-Fi capabilities to allow connectivity to a mobile app that runs on the user’s mobile device. For this, we’ve leveraged technologies such as Xamarin that allow our firmware developers to use the same code base to develop the app that runs on both the instrument and the user’s mobile device. David P.: There are a number of firsts because the 155 and its platform is all new for Lake Shore. We are using all-new embedded processors and a whole new code base. The chassis is new, too. This allowed us to explore newer technologies like Wi-Fi, mobile app connectivity, and the touchscreen interface. What we have learned building this platform will be used on future instruments. This will help in creating reliable instruments that are also familiar to use across our lineup. Dave G.: As David said, the 155 is an entirely new instrument. It is also the current flagship of our new XIP platform. It establishes Lake Shore’s new design language and it presents information to users through our new TiltView touchscreen. The more precise and cleaner the excitation signal is, the better the end measurement can be. What went into designing a source capable of generating an ultra-low noise excitation signal? Adam: This was quite the technical challenge when combined with the fact we had proposed using a switching power supply from the outset. This was proposed for several reasons, including ease of use for the customers and our OEMs plus the reduction in heat that needs to be dissipated within the box. Also, because the instrument outputs both DC and AC using the same circuitry, noise tends to easily take a hit due to the wider bandwidth component selection required in order to achieve AC functionality. The fact this instrument is an AC plus a DC source and maintains noise performance better than many DC-only competitors in most cases is a technical achievement we’re quite proud of. David P.: The original design focused more on precision and ease of use rather than ultra-low noise. As we began verifying our design, we found ways to improve upon our noise floor. Starting from the power supply rails, to the voltage references, to the output circuitry, we figured out where the sources of noise were coming from and minimized the noise as much as possible. Once we went through everything and could come up with a noise floor for the instrument, we found that we were better than many competitors. Some competitors will use external filters to lower the noise floor of their source, but adding these filters lowers the output bandwidth. The noise specifications of the 155 are without any external filters and with the full bandwidth, which is a bandwidth of 100 kHz. The 155 also features a future-proof architecture. How did the design team set out to build an instrument that would grow as the user’s measurement needs evolved? Adam: From a firmware perspective, we’ve chosen to use top-of-the-line microprocessors and maximized memory to ensure room for feature growth and data processing/storage in the series. In addition, we’re using the advanced connectivity features of the platform to allow future firmware updates similar to the way your smartphone notifies you if your operating system or app needs updating. Part of the design effort included leveraging our past experiences while keeping an eye on our product roadmap to generate electrical, mechanical, and software requirements for the platform. While we can’t accurately predict all instrument needs for the next 10 years right now, we tried to apply the “open/closed principle” from the software world to the hardware design as well. The principle states that a design should be open for extension but closed for modification. The intent of this approach is to allow us to respond to customer and market feedback more quickly, minimizing the need to redesign hardware and software for new features. David P.: To add to that, our new microprocessor architecture and connectivity options allow firmware updates to be downloaded to the instrument directly. This allows us to add new features and fixes to the software to enhance the functionality of the instrument. The focus on software reusability also is very important. If we develop a new feature or function on a future instrument, it will be much easier to port that new feature to other instruments in the lineup. 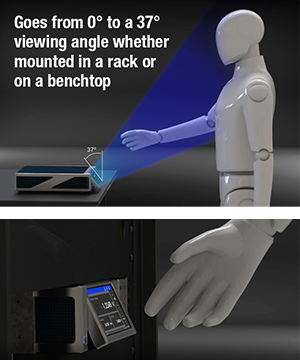 What else has the team envisioned for the MeasureReady™ series? David P.: Well, I just mentioned the advanced connectivity options. Because of these options, we can see more of our instruments working together, sharing data that is pertinent between instruments. We are also looking to make it easy to integrate our source with different meters on the market to make a complete source and measure solution. Dave G.: Taking what David said further, I think we should mention what the MeasureReady philosophy is all about, and that’ll help explain where we’re going. With MeasureReady, we’re aiming to bring to market self-contained instruments that are designed to be readily integrated into measurement systems. This could be in any number of ways. Right now, we’re closely monitoring areas of active research to prepare characterization tools that will meet various requirements—whether it’s for low power, low noise, or some other requirement—of the devices and systems in the future. In the near term, we’ll be listening for feedback from our users and considering natural evolutions of a source instrument, like additional waveform shapes, for instance. The MeasureReady™ 155 Precision I/V Source is now shipping.